INCLUDES SMASHES : "CAT SCRATCH FEVER" - "STRANGLEHOLD" - "WANGO TANGO" - "BABY, PLEASE DON'T GO" & "PARALYZED"
In 1981, Epic Records honored Ted Nugent with his first hits collection, the multi-platinum "Great Gonzos – The Best Of Ted Nugent ." The Lp was a blockbuster as it rocked the retail charts, proving once again that his career was of historic merit. Filled with his best known smashes like "Cat Scratch Fever" "Baby, Please Don't Go" "Stranglehold" plus the stellar "Dog Eat Dog", "Great Gonzos" is surely one of the finest hard rock hit albums ever! 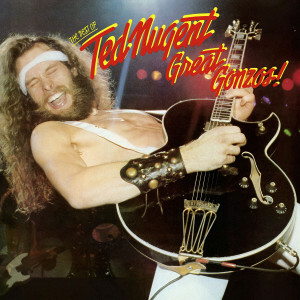 Friday Music is very pleased to announce the limited edition 180 Gram Audiophile Vinyl release of "Great Gonzos – The Best Of Ted Nugent." Mastered impeccably by Joe Reagoso & manufactured at R.T.I. on translucent gold vinyl, this fine Lp will be a much anticipated audiophile dream release for "Motor City Madman" fans everywhere! For this presentation, we are also including stunning gatefold artwork, with two photo's of Ted Nugent from the Sony Music archives, as well as a 12” x 12” poster insert of the Detroit rocker. In 1981 after many chart topping rock albums and a bevy of hit rock radio singles, more fame followed as the brass at Epic Records honored their journeyman Ted Nugent with his first hits collection, the multi-platinum Great Gonzos – The Best Of Ted Nugent . The album was a blockbuster as it rocked the retail charts, proving once again that his career was of historic merit. Filled with his best known hard rock classic, the amazing album takes off with his 1977 smash hit Cat Scratch Fever. This hard rock favorite is followed with nine more of his most famous songs including the mega-hit Stranglehold from his first solo album, plus the stellar Dog Eat Dog from his classic Free For All lp. More treasures follow with the hard rock/blues belter Baby! Please Don’t Go as a live nod to his Amboy Dukes days plus his guitar workout Paralyzed and the Nugent shouter Wango Tango, which truly make the album a treasure trove of hits. In honor of the Motor City Madman, Friday Music is very pleased to announce the limited edition 180 Gram Audiophile Vinyl release of the Epic Records classic Great Gonzos – The Best Of Ted Nugent. As a another fine installment in our exciting Ted Nugent 180 Gram Audiophile Vinyl Series, we are very pleased to present this masterwork in all its motorific glory. Mastered impeccably by Joe Reagoso at Friday Music Studios and Capitol Mastering and manufactured at R.T.I. on translucent gold vinyl, Great Gonzos – The Best Of Ted Nugent will be a much anticipated audiophile dream release for his fans everywhere! For this exclusive presentation, we are also including for the stunning gatefold artwork which includes the groundbreaking Lp cover photo, as well as two rare photos of Ted Nugent, as well as a 12” x 12” poster insert of the Detroit rocker. We are also enclosing a poly bag to protect your album cover and poly lined inner sleeve to help keep your Ted Nugent vinyl in mint shape. Great Gonzos – The Best Of Ted Nugent …A history making album from a historic legend, an audiophile dream release…stellar gatefold cover…is now an audiophile gold vinyl dream come true…From your friends at Friday Music!